TK-4944 (JP Rivard) of the Canadian garrison is trying to be the first 501st member to actually make it into space. how cool would that be for a Star Wars 501st Stormtrooper to make it into space. Well in order for him to be that man he has to get as many votes as he can. 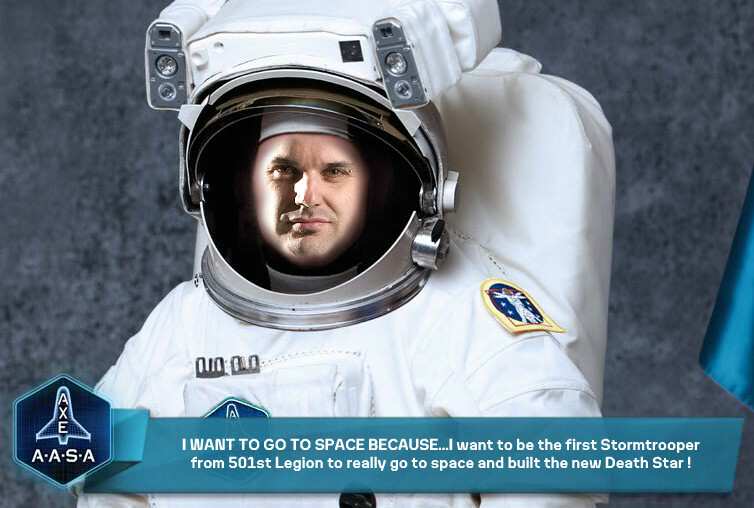 So here is the link to his voting page, now click away and help get this Trooper in to space. AXE, the body product for me, has started the AXE Apollo Space Academy. Only 2 Canadian citizen will ha the chance to do the space Camp and make a real travel in space! I NEED YOUR HELP …AND YOUR VOTE !!! Together we ca unite to send the first Stormtrooper in space for real and maybe start to built the new DEATH STAR. Imagine a member of the 501st Legion in space, what a stunt we could do and the news could spread all across the world and give the Legion such a visibility. One of the first voyager in space can be a STORMTROOPER, a real Star Wars Fan! !